Human bone marrow mesenchymal stem cells (hBMSCs) are multipotent cells that can differentiate into a variety of cell types. Elevated expression of peroxisome proliferator-activated receptor-γ (PPARγ) promotes the adipogenic differentiation of hBMSCs, and reduces their osteogenic differentiation. MicroRNAs (miRNAs) have been shown to play important roles in the regulation of hBMSCs differentiation. Because bioinformatic analysis has indicated that PPARγ is a candidate target of miR-548d-5p, the aim of this study was to assess the impact of miR-548d-5p on the dexamethasone-induced adipogenic differentiation of hBMSCs. A quantitative RT-PCR (qRT-PCR) assay was used to compare miR-548d-5p expression levels in dexamethasone-induced hBMSCs and uninduced control cells. Oil red O staining, cellular triglyceride (TG) content, and the mRNA and protein levels of PPARγ and CCAAT/enhancer binding protein α (C/EBPα) were used to evaluate the adipogenic differentiation of hBMSCs. Alkaline phosphatase (ALP) activity and levels of osteocalcin (OCN) and Runx2 were used to evaluate the osteogenic potential of hBMSCs. Compared with untreated cells, miR-548d-5p expression levels were downregulated during dexamethasone-induced adipogenic differentiation of hBMSCs. In contrast to the profuse Oil Red O staining in the cytoplasm of dexamethasone + scrambled miRNA-treated cells, there was limited staining in the cytoplasm of dexamethasone + miR-548d-5p-treated cells, indicating the absence of adipocytes. Moreover, compared with scrambled miRNA-treated cells, treatment with miR-548d-5p suppressed cellular levels of PPARγ and C/EBPα mRNA and protein, and cell TG content (P < 0.05). In contrast, compared with scrambled miRNA-treated cells, cellular levels of OCN and Runx2 mRNA and protein, as well as ALP activity, were significantly higher in miR-548d-5p-treated cells (P < 0.05). Western blot and luciferase reporter assays confirmed that miR-548d-5p directly targeted the 3′-untranslated region of PPARγ. miR-548d-5p is downregulated during dexamethasone-induced adipogenic differentiation of hBMSCs. 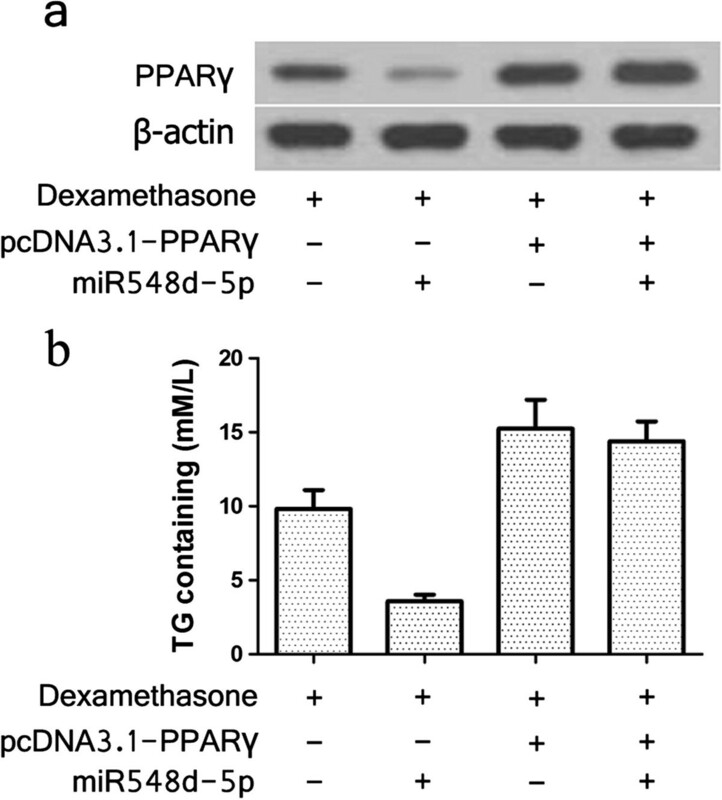 By directly targeting and downregulating PPARγ, miR-548d-5p suppresses the dexamethasone-induced adipogenic differentiation of hBMSCs and enhances their osteogenic potential. Our findings suggest that miR-548d-5p has potential in the treatment of corticosteroid-induced osteonecrosis of the femoral head. Human bone marrow mesenchymal stem cells (hBMSCs) are multipotent cells that can differentiate into a variety of cell types, including adipocytes, osteoblasts, and chondrocytes [1–3]. While hBMSCs differentiation is known to be modulated by a number of regulatory factors and complex signaling pathways [4, 5], it remains largely uncharacterized. A variety of human diseases, such as osteoporosis, age-related bone loss, and osteonecrosis, have been linked to imbalances between adipogenic and osteogenic differentiation of hBMSCs [6, 7]. For example, osteonecrosis of the femoral head (ONFH), resulting from increased intraosseous pressure and ischemia in the femoral head, is frequently observed in patients treated with elevated doses of corticosteroids . Treatment of hBMSCs with pharmacological doses of glucocorticoids increases intracellular triglycerides and promotes adipogenic differentiation , a complex process involving a coordinated cascade of multiple transcription factors and signaling pathways. Induction of the adipogenic genes that ultimately give rise to the phenotype of terminally differentiated adipocytes is co-ordinated by CCAAT/enhancer binding protein α (C/EBPα) and peroxisome proliferator-activated receptor-γ (PPARγ) [10, 11], a member of the ligand-activated nuclear receptor superfamily of transcription factors [10–12]. Elevated cellular levels of PPARγ promote the adipogenic differentiation of hBMSCs and inhibit their osteogenic differentiation, increasing cellular lipid levels and decreasing bone formation . Consistent with this, down-regulation of PPARγ inhibits the adipogenic differentiation of rabbit BMSCs, and promotes their osteogenic differentiation potential, an effect that would potentially antagonize corticosteroid-induced ONFH [14, 15]. MicroRNAs (miRNAs) are small non-coding RNAs that regulate gene expression by targeting complementary sequences located primarily within the 3′-untranslated regions (UTRs) of their target mRNAs [16–18]. miRNAs play well-characterized pivotal roles in a variety of biological processes, including cell fate determination in embryonic stem cells, cell proliferation, apoptosis, differentiation, morphogenesis, and carcinogenesis [19–22]. Additionally, miRNAs have been shown to participate in the regulation of adipogenic and osteogenic differentiation in hBMSCs [23–25]. Although bioinformatic analysis has implicated PPARγ as a candidate target of miR-548d-5p, the effect of miR-548d-5p on glucocorticoid-induced adipogenic differentiation of hBMSCs remains obscure. In the present study, we measured cellular levels of miR-548d-5p during dexamethasone-induced adipogenic differentiation of hBMSCs, and assessed the effect on this process of treatment of hBMSCs with miR-548d-5p. hBMSCs were purchased from Cyagen Biosciences Co. Ltd. (Guangzhou, China), cell identification by flow cytometry revealed that hBMSCs were positive for CD29, CD44 and CD105, negative for CD34 and CD45. They were cultured in low glucose complete DMEM culture medium (containing 10% fetal bovine serum, 100 kU/mL penicillin, 100 mg/L streptomycin, 50 mg/L vitamin C, 1 mmol/L L-glutamine, and 20 mmol/L HEPES) and incubated in a humidified atmosphere of 5% CO2 at 37°C. The third passage hBMSCs were used in this study. Dexamethasone was added to hBMSCs medium which requiring dexamethasone induction at a final concentration of 10−7 mol/L. The same concentration of dexamethasone was added to new medium each time it was replaced. The miR-548d-5p agomir (GMR-miR™ microRNA-548d-5p agomir) used in this study was synthesized by Shanghai GenePharma Co. Ltd. (Shanghai, China). Prior to transfection, hBMSCs were plated in six-well plates at a density of 1.5 × 105 cells/well. Once cells reached ~50% confluence, transient transfections were conducted using Lipofectamine™2000 (Invitrogen, Carlsbad, CA, USA) following the manufacturer’s instructions, each well was transfected with 50nmol miR-548d-5p agomir. Total RNA was extracted from cells using a Total RNA Kit (OMEGA, Norcross, GA, USA), according to the manufacturer’s instructions. cDNA was synthesized using the RevertAid First Strand cDNA (Thermo Fisher Scientific, Waltham, MA, USA). qRT-PCR was carried out using SYBR Green I (TaKaRa, Dalian, China), and gene expression levels were normalized to GAPDH. All experiments were performed in triplicate. To verify mature miRNA expression levels, qRT-PCR was performed using a High-Specificity miR-548d-5p qRT-PCR Detection Kit (Stratagene Corp, La Jolla, CA, USA) in conjunction with an ABI 7500 thermal cycler, according to the manufacturer’s recommendations. The miR-548d-5p expression level was normalized to U6 small nuclear RNA (U6 snRNA), and measured using the comparative Ct (2-ΔCt) method. The primers for miR-548d-5p were 5’GTCGTATCCAGTGCAGGGTCCGAGGTATT CGCACTGGATACGACGGCAAAA3’ (RT primer), 5’TCCGAAAAAGTAATTGTGGT 3’ (forward), 5’GTGCAGGGTCCGAGGT 3’(reverse). The primers for U6 were 5’GTCGTATCCAGTGCAGGGTCCGAGGTATTCGCACTGGATACGACAAAATA3’ (RT primer), 5’TCCGATCGTGAAGCGTTC3’ (forward), 5’GTGCAGGGTCCGAGGT 3’ reverse). Oil red O staining was conducted at day 14 following dexamethasone treatment. Cells were washed twice with PBS and fixed with 10% formalin for 10 min at room temperature. After fixation, cells were stained with filtered oil red O solution for 1h at room temperature. Cellular TG content was determined using a Triglyceride Determination Kit (Applygen, Beijing, China) at day 14 of dexamethasone treatment. hBMSCs were collected, with a final cell density of 1 × 106 cell/mL in each group. After centrifugation at 1000 r/min for 10 min, cells were washed twice with PBS and lysed with 1% TritonX-100 for 30 min. Then, 3 μL of cytochylema and 300 μL of working solution were added into 96-well plates, meanwhile set blank wells and calibration wells. Cells were incubated at 37°C for 5 min after blending, and the absorbance values were measured at a wavelength of 500 nm. ALP activity was determined using an enzyme-linked immunosorbent assay (ELISA) test kit (R&D Systems, Minneapolis, MN, USA) at day 6 of culture. hBMSCs were suspended in 1 mL buffer solution and centrifuged at 15 000 r/min for 15 min at 4°C after repeated freezing-thawing treatment to lyse the cells. Set standard wells on the ELISA plates and prepared standard solution. Forty microliters of diluent and 10 μL of supernatant were added into sample wells, and incubated at 37°C for 30 min after blending, meanwhile set blank wells. After washing 3 times, 50 μL of horseradish peroxidase was added into the sample wells, and incubated at 37°C for 30 min. After washing for three times, 100 μL of chromogenic solution was added and incubated at 37°C for 15 min. Finally, 50 μL of stop solution was added and absorbance values were measured at a wavelength of 450 nm. By bioinformatic analysis using TargetScan (http://www.targetscan.org/) and miRBase (http://www.mirbase.org/), we suggest that PPARγ as a candidate target of miR-548d-5p. Human PPARγ 3′-UTR fragments containing putative binding sites for miR-548d-5p were amplified by PCR from human genomic DNA. Mutant PPARγ 3′-UTRs were obtained by overlap extension PCR. The fragments were cloned into a pmirGLO reporter vector (Promega), downstream of the luciferase gene, to generate the recombinant vectors pmirGLO-PPARγ-Wt and pmirGLO-PPARγ-Mut. For the luciferase reporter assay, hBMSCs were transiently co-transfected with miRNA (miR-548d-5p agomir or scrambled negative control) and reporter vectors (wild-type reporter vectors or mutant-type reporter vectors), using Lipofectamine™2000 (Invitrogen, Carlsbad, CA, USA). Luciferase activities were measured using a Dual-Luciferase assay kit (Promega, Madison, WI, USA) according to the manufacturer’s instructions at 48 h post-transfection. Total proteins of cultured cells were extracted using RIPA buffer containing phenylmethanesulfonylfluoride. Protein concentration was determined using the BCA protein assay kit (Beyotime, Haimen, China) according to the manufacturer’s protocol. Proteins were subjected to sodium dodecyl sulfate polyacrylamide gel electrophoresis and transferred onto polyvinylidene difluoride membranes. After blocking, the membranes were incubated overnight at 4°C with diluted (1:300) primary antibodies (monoclonal mouse anti-PPARγ or anti-C/EBPα or anti-OCN or anti-Runx2; Santa Cruz Biotechnology, Dallas, TEX, USA). Following extensive washing, the membranes were incubated with diluted (1:3000) horseradish peroxidase-conjugated rabbit anti-mouse IgG (Santa Cruz Biotechnology, Dallas, TEX, USA). Signals were determined using a chemiluminescence detection kit (Amersham Pharmacia Biotech, Piscataway, NJ, USA). An antibody against β-actin (Santa Cruz Biotechnology, Dallas, TEX, USA) served as endogenous reference. Data are presented as mean ± standard deviation. Data processing was performed by analysis of variance. Pairwise comparison among groups was performed using multiple comparisons tests. Statistical analysis was performed with SPSS 17.0 software (SPSS Inc., Chicago, IL, USA). Differences with P < 0.05 were considered statistically significant. Based on studies showing that supraphysiological doses of glucocorticoids induce the differentiation of hBMSCs into adipocytes, 10−7 mol/L of dexamethasone was chosen as the effective dose . Compared with non-induced (Blank) cells, hBMSCs cultured in the presence of dexamethasone had higher cytoplasmic oil red O staining (Figure 1a) and higher TG content (P < 0.05; Figure 1b) after 14 days, and decreased levels on day 6 of ALP, an early marker of osteogenic differentiation (P < 0.05; Figure 1c). Moreover, relative to cells in the Blank group, dexamethasone-treated hBMSCs had lower levels of miR-548d-5p (day 7 and day 14, P < 0.05; Figure 1d) and the osteogenic markers Runx2 and OCN (day 6, P < 0.05, Figure 1e, 1g). Furthermore, qRT-PCR (day 6, P < 0.05; Figure 1f) and western blotting (day 6, Figure 1h) showed that levels of the adipogenic transcription factors PPARγ and C/EBPα were higher in the dexamethasone-induced group than in the Blank group. Collectively, these results confirm the induction by dexamethasone of adipogenic differentiation in hBMSCs, and its inhibition of osteogenic differentiation in these cells. The induction of miR-548d-5p expression in dexamethasone-treated hBMSCs suggested to us that miR-548d-5p had a role in the regulation of their adipogenic differentiation. Dexamethasone induces adipogenic differentiation of hBMSCs and downregulates miR-548d-5p expression. Blank, non-induced hBMSCs; Dexamethasone-induced, hBMSCs induced with dexamethasone. (a) Oil red O staining showing more adipocytes were detectable in the cytoplasm of the cells in the dexamethasone-induced group than the Blank group at day 14. (b) TG content was measured at day 14. (c) ALP activity was measured using ELISA at day 6. (d) Expression levels of miR-548d-5p in the Dexamethasone-induced group and Blank group were measured by qRT-PCR at day 7 and day 14. U6 was used as an internal control. (e,f) qRT-PCR analysis of Runx2, OCN, PPARγ, and C/EBPα. The data were normalized to GAPDH. (g,h) Runx2, OCN, PPARγ, and C/EBPα protein levels were detected by Western blotting analysis, β-actin was used as a reference. We next sought to elucidate the role of miR-548d-5p during dexamethasone-induced adipogenic differentiation of hBMSCs by transfection studies using the miR-548d-5p agomir. Cells were divided into four groups, namely: Blank Group: untransfected, uninduced hBMSCs; Control Group: untransfected hBMSCs induced with dexamethasone; NC Group: scrambled agomir-transfected hBMSCs induced with dexamethasone; and miR-548d-5p Group: miR-548d-5p agomir-transfected hBMSCs induced with dexamethasone. qRT-PCR analysis showed that miR-548d-5p levels were eight-fold higher in the miR-548d-5p Group compared with the Control and NC groups (day 2, Figure 2b). Oil red O staining assay on day 14 of induction showed that, in contrast to cells in the Blank and miR-548d-5p groups, in which no or few cells stained positive, cells in the Control and NC groups contained reddish-orange fat droplets in their cytoplasm (Figure 2a). Consistent with this, TG content in the Blank and miR-548d-5p groups was significantly lower than in the NC and Control groups (day 14, P < 0.05; Figure 2c). Moreover, the higher ALP activity in the miR-548d-5p group relative to the NC and Control groups (day 6, P < 0.05; Figure 2d) suggested that miR-548d-5p maintained the osteogenic potential of hBMSCs. 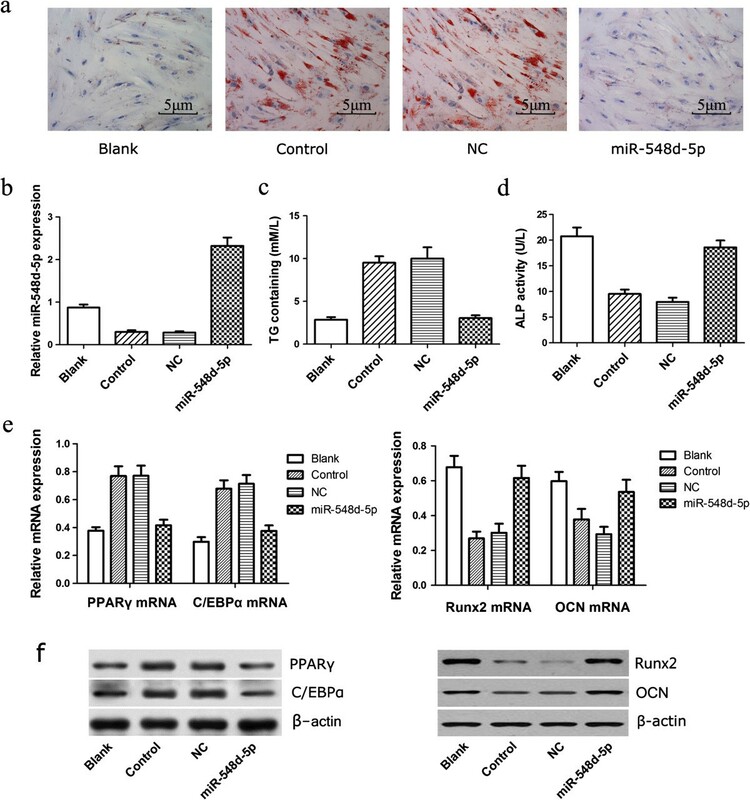 Compared with the NC and Control groups, overexpression of miR-548d-5p depleted PPARγ and C/EBPα at both the mRNA and protein levels (P < 0.05), and increased protein levels of the osteogenic markers Runx2 and OCN (P < 0.05) (day 6, Figure 2e, 2f). These results indicated to us that overexpression of miR-548d-5p suppressed the dexamethasone-induced adipogenic differentiation of hBMSCs and supported the osteogenic potential of these cells. Overexpression miR-548d-5p suppresses dexamethasone-induced adipogenic differentiation of hBMSCs. Blank, non-transfected and non-induced cells; Control, non-transfected hBMSCs induced with dexamethasone; NC, cells transfected with scrambled miR-548d-5p negative control and induced with dexamethasone; miR-548d-5p, cells transfected with miR-548d-5p agomir and induced with dexamethasone. (a) Oil red O staining on day 14 of culture. (b) Mature miR-548d-5p expression levels after transfection, U6 was used as an internal control. (c) TG containing was measured at day 14. (d) The ALP activity in the Control and NC groups were significantly lower than in the Blank group (P < 0.05), but there were no significant differences between the miR-548d-5p and Blank groups (P > 0.05). (e) PPARγ, C/EBPα, Runx2, and OCN mRNA levels were detected by qRT-PCR analysis. The data were normalized to GAPDH. (f) PPARγ, C/EBPα, Runx2, and OCN protein levels were detected by western blotting analysis, β-actin was used as a reference. Bioinformatic analysis using TargetScan and miRanda indicated that PPARγ is a candidate target of miR-548d-5p (Figure 3a), leading us to speculate as to whether miR-548d-5p could directly down-regulate PPARγ expression. Western blotting assay indicated that overexpression of miR-548d-5p substantially decreased cellular levels of PPARγ (Figure 3b). Consistent with this, we found that compared with cells in the NC group, luciferase activity was reduced by cotransfection of miR-548d-5p with the pmirGLO-PPARγ-Wt vector, but not the pmirGLO-PPARγ-Mut vector (Figure 3c). These results indicated that miR-548d-5p regulated PPARγ expression by directly targeting the 3′-UTR of PPARγ. PPARγ is a target of miR-548d-5p in hBMSCs. (a) The putative miR-548d-5p seed region in the PPARγ 3’-UTR. (b) Western blotting analysis of PPARγ expression in transfected cells. β-actin was used as a reference. Blank, nontransfected cells; NC, cells transfected with scrambled miR-548d-5p negative control; miR-548d-5p, cells transfected with miR-548d-5p agomir. (c) Luciferase activity determined 48 h after transfection. Control, scrambled miRNA; miR-548d-5p, miR-548d-5p agomir; pmirGLO-PPARγ-Wt, wild-type pmirGLO-PPARγ; pmirGLO-PPARγ-Mut, mutant pmirGLO-PPARγ. *P < 0.05 compared with the control group. Western blotting analysis showed that cell levels of PPARγ were decreased in miR-548d-5p agomir-transfected hBMSCs, but not in cells co-transfected with miR-548d-5p agomir and PPARγ lacking the 3′-UTR sequence (pcDNA3.1-PPARγ) (Figure 4a). Moreover, we found that TG content was not decreased in hBMSCs co-transfected with pcDNA3.1-PPARγ and miR-548d-5p agomir (Figure 4b). These results indicated that PPARγ expression restores the anti-dexamethasone-induced adipogenic differentiation function of miR-548d-5p. Expression of PPARγ abrogates the anti-dexamethasone-induced adipogenic differentiation function of miR-548d-5p. (a) Western blotting analysis of hBMSCs transfected with pcDNA3.1-PPARγ lacking the 3′-UTR sequence and/or miR-548d-5p. β-actin was used as a reference. (b) TG content was measured in hBMSCs transfected with pcDNA3.1-PPARγ lacking the 3′-UTR sequence and/or miR-548d-5p. miRNAs play important roles in the regulation of hBMSCs differentiation. miR-141 and miR-200a, for example, have been reported to regulate osteoblast differentiation by targeting the BMP-2 signaling pathway . Moreover, miR-346 positively regulates hBMSCs osteogenic differentiation by targeting GSK-3β and activating the Wnt/β-catenin pathway . In the current study, we found that miR-548d-5p inhibits dexamethasone-induced adipogenesis in hBMSCs by targeting PPARγ. Our data indicate that miR-548d-5p overexpression down-regulated PPARγ levels by directly targeting the 3′-UTR of PPARγ mRNA. Luciferase reporter gene assays demonstrated that this effect was largely eliminated when bases in the PPARγ mRNA 3′-UTR targeted by miR-548d-5p were mutated. PPARγ is one of the most important cell-fate-defining factors in hBMSCs. It has been shown to positively regulate adipogenesis [28, 29], and is one of the earliest induced genes in preadipocytes . Consistent with this, we found that PPARγ was induced at both the mRNA and protein levels during dexamethasone-induced adipogenesis in hBMSCs, an effect that was abrogated in the presence of transfected miR-548d-5p. These data indicated that miR-548d-5p overexpression suppressed PPARγ at both the mRNA and protein levels, and in doing so inhibited dexamethasone-induced adipogenic differentiation. Runx2 is a master regulator of osteogenesis in hBMSCs, and was the first transcription factor to be shown to be required for determination of the osteoblast lineage . Analogous to PPARγ in adipogenic differentiation, Runx2 mediates the effects of a variety of cytokines in determining the osteogenic differentiation of hBMSCs . We found that expression of Runx2 and OCN were increased in the presence of miR-548d-5p, as was the activity of ALP, which plays an important role in the process of osteoblast differentiation of hBMSCs . Collectively, these data implied that miR-548d-5p promotes the osteogenic potential of dexamethasone-induced hBMSCs. In conclusions, miR-548d-5p is downregulated during dexamethasone-induced adipogenic differentiation of hBMSCs. miR-548d-5p inhibits steroid-induced adipogenesis of hBMSCs and maintains their osteogenic potential by targeting PPARγ. Our findings suggest that miR-548d-5p has potential in the treatment of corticosteroid-induced osteonecrosis of the femoral head. This study was supported by the National Natural Science Foundation of China (No. 81171776). JS, YL and GZ performed and participated in analysis of laboratory experiments data. YW, YL and GZ participated in the design of experiments. YW, YL provided administrative support and funded experiments. JS, YW and GZ drafted the manuscript. All authors have contributed and approved the final manuscript.